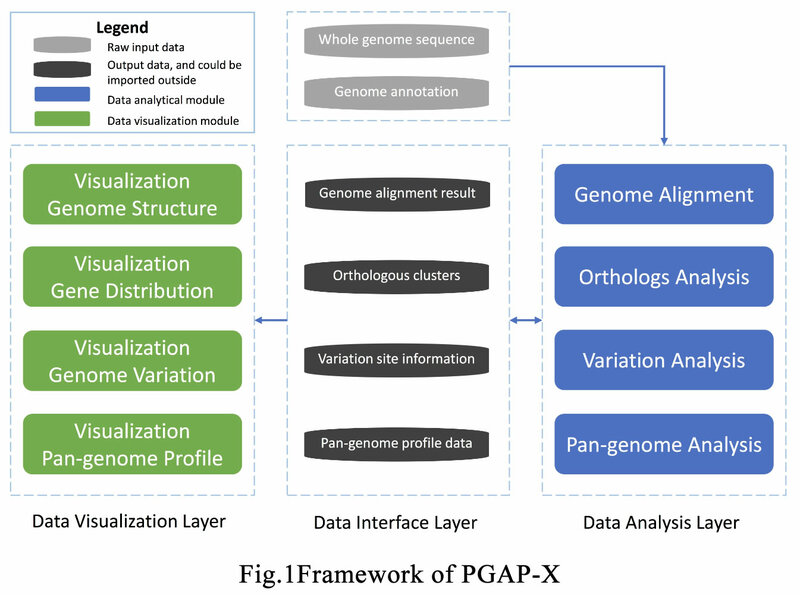 PGAP-X is a microbial comparative genomic analysis platform with graphic interface. Serials of algorithms and methodologies have been developed and integrated to analyze and visualize genomics structure variation, gene distribution with different conservative levels, and genetic variation from pan-genome sight. 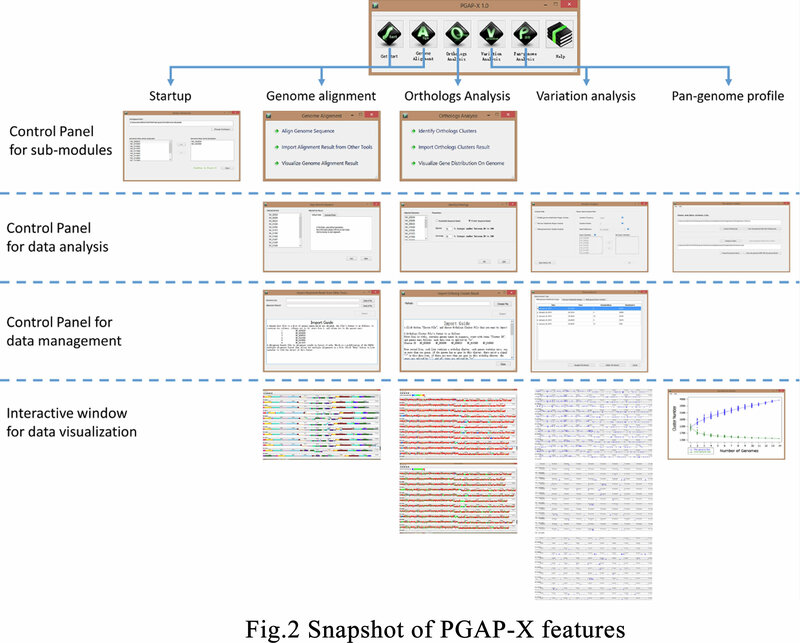 At the same time, analytical result data from many other programs, including genome alignment result and orthologs clusters, are also supported to be further analyzed or visualized in PGAP-X. The workflow and feature snapshot in PGAP-X were shown as Fig.1 and Fig.2. All history version of PGAP-X were archived, and view all download. To test the performance of PGAP-X, two kinds of example datasets were provided. According to your operation system(i386/x86 or x64), please select the proper program or source code. For Windows users: we strongly recommend to use the pre-complied programs. For Ubuntu 12.04 users: if you were using Ubuntu 12.04 (either 32-bit or 64 bit), the pre-complied programs were recommended. For other users: source code was recommended for other linux distribution, like Fedora, other version of Ubuntu, and so on. For Windows version: Uncompress the pgapx_x.x_binary_windows.zip, and then double click pgapx.exe. For Ubuntu version: Uncompress the pgapx_x.x_binary_ubuntu_i386.zip or pgapx_x.x_binary_ubuntu_amd64.zip file, and then enter the root directory via the terminal. Type chmod -R +x * to grant executable premission to all the programs, and then double click pgapx to launch PGAP-X. After compiling, please rename thirdparty.i386(32-bit system) or thirdparty.x64(64-bit system) to thirdparty, and then copy the foler to the same directory of pgapx, and then double click pgapx to launch PGAP-X.